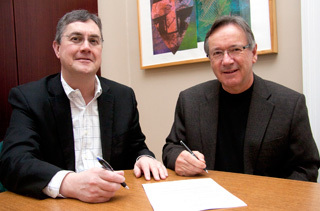 The University of New Brunswick and Shad Valley have renewed their partnership through the signing of a Memorandum of Understanding recently. UNB, in partnership with the provincial government, has committed to supporting students who attend the Shad Valley program. Shad Valley 2012 begins Sunday, July 1 and run until July 27. UNB is proud to be one of the host campuses for the program participants. While the Shads attend the program at UNB, they will be staying in residence. The lectures, workshops and guest speakers will be located on campus. There are also tours and field trips scheduled for local and provincial sites. Shad Valley is an exciting summer program designed especially for top Canadian students. The focus of the program is in three main areas: excellence and leadership; science and technology; and entrepreneurship. Shad Valley takes these three elements and combines them to form a challenging, exciting and educational experience. Shad Valley is a program administered by Shad Valley International. Working in partnership with business, education and other communities, Shad Valley International is dedicated to the advancement of scientific and technological capabilities of youth, integrated with the development of their entrepreneurial spirit. Shad Valley is an award winning partnership involving ten host universities as well as hundreds of schools, students, companies and countless other organizations. The program has over 11,000 alumni across Canada and around the world.